Six meters, often called the ‘magic band’ can be mystifying at times. Bridging between the HF spectrum and the VHF/UHF spectrum, 6 meters shares the propagation vagaries of both. You quite never know when sporadic-E is going to open up or an inversion layer sets in and whisks your signals to who know where. If you are a lover of 6 meters, then this antenna is for you. The 6 meter J-Pole is my favorite antenna. 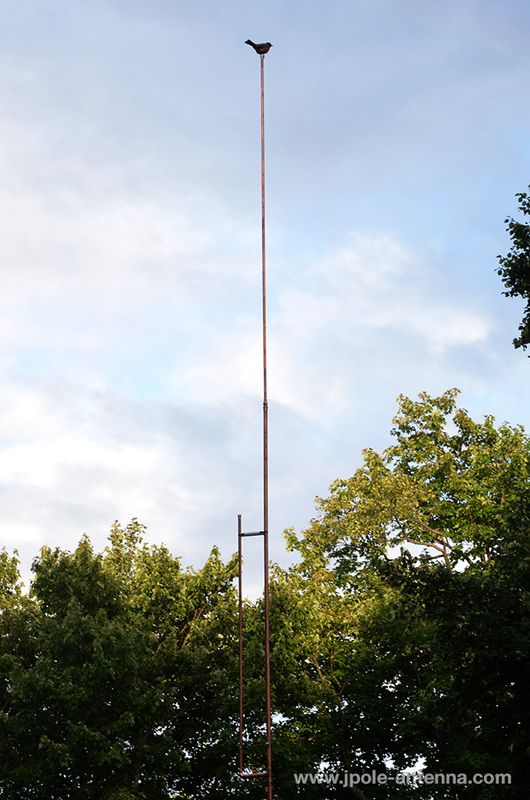 A monster of an antenna measuring 13.5 feet; the six meter J-Pole will exceed your expectations. Click to see a full size picture.It outperforms most commercial antennas with its solid 3 db of gain. Excellent performance; hit repeaters 40 miles away with only 5 watts. The 6 meter J-Pole features a two piece design for shipping and easy storage. It is constructed of a combination of 3/4 and 1/2 inch copper tubing for rigidity and light weight. The antenna also has a stabilizer to keep the matching stub from swaying in the wind. The antenna is vertically polarzied for FM work and is pretuned to the 52.525 Mhz calling frequency. The antenna can also be custom tuned to any frequency within the 6 meter band upon request. 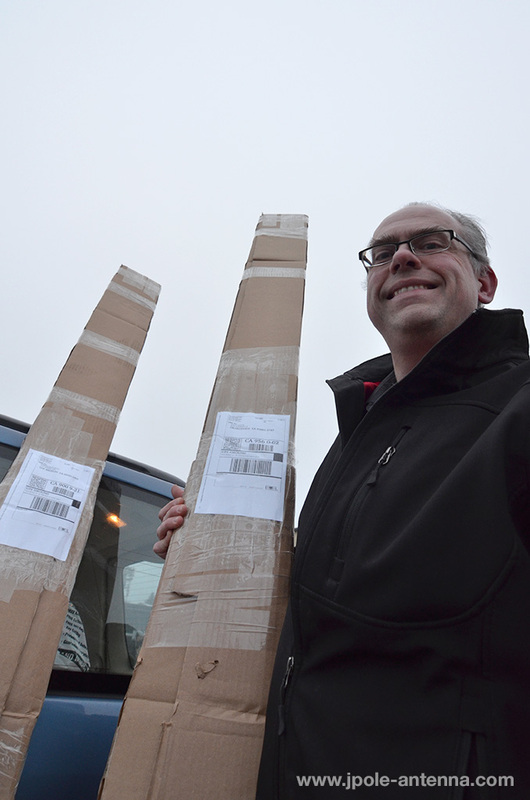 The antenna comes shipped in two pieces. The lower section uses a 3/4 inch copper for rigidity and the upper section uses 1/2 inch copper for too keep the weight down. A plastic stabilizer bar keeps the matching section in place and to prevent excess vibration from damaging the feedpoint connection. When the two pieces are assembled, the antenna has a total length of 13.5 feet. Total weight of the antenna is 7.5 lbs. 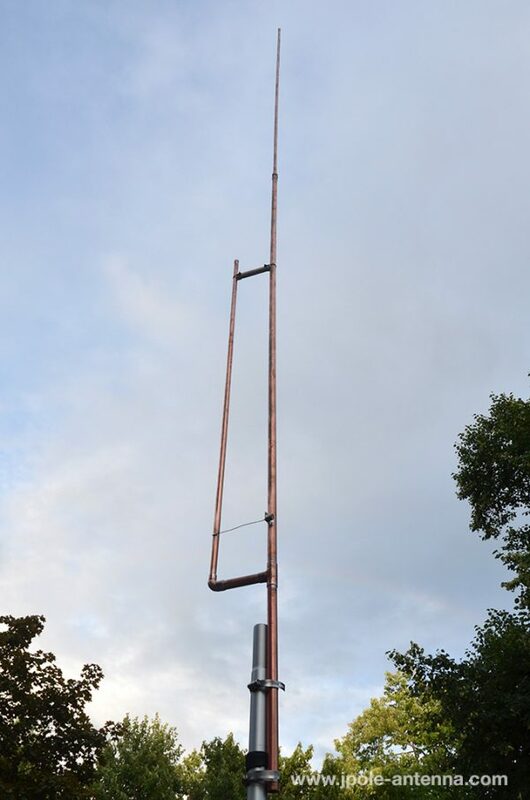 Chris, KI4JVK writes: “Speak softly, but carry a BIG STICK” Words of wisdom that aptly apply to the photo of KB9VBR 6 meter Copper J-Pole mounted on a 1 7/8 diameter 20′ long galvanized pipe at my Qth.The antenna speaks “softly” with a MFJ-9406X Tranceiver (10 watts PEP)!I have QSL’s in Canada,USA and the Carribean.The magic band you gotta luv it! The 6 meter J-Pole antenna is shipped UPS Ground in a sturdy box. All the 6 meter antennas as custom built when you order is placed; average build time is about 3-4 days. UPS Ground shipping is 2-5 days, so you can expect your antenna in about 6-9 business days, depending on your location. If you are interested in purchasing another antenna along with the 6 meter model, please contact me first as there may be a shipping discount when a small antenna is combined with the 6 meter model. Everything is fine except that you have the shield to the long end and the center conductor to the stub? Every J-Pole I”ve seen is the opposite. Strange. As an option I drilled a and soldered a 1/4-20 nut to the inside of the 1/2 cap of the shorter tuning stub making sure there is a lot solder holding it in place. (Also make sure you place a 1/4-20 nut on a well greased STEEL bolt prior to threading it in to the nut INSIDE prior to soldering. Make sure its tight as well.) The solder will hold the nut in place. Once you assemble the tuning stub and you solder the cap to the end you can remove the Steel nut and 1/4-20 bolt Replacing it with a 1/4-20 BRASS Bolt and Nut. By doing this it allows you to fine tune the SWR for the lowest possible reading. It works great for me. That’s a great idea with using a bolt/nut combination to fine tune the antennas. The 6 meter J-Pole is tuned for 52.525Mhz, so this will give you a little better SWR towards the band edge. As for the connector; you have probably found out by searching online, there are plans that attach the center conductor of the coax on either side of the antenna. I have experimented with attaching the center connector of the SO-239 to the stub and to the main radiator. I have not found a difference in signal quality or performance. I choose to mount the edge of the connector onto the main radiator because I believe it makes a better mechanical connection. Looking at a J-Pole antenna, you would assume that the center connector should be connected to the main radiator, but with the way the antenna is designed and the way it is fed, the RF energy will travel up and radiate up the resonant part of the antenna. RF energy, like electricity chooses the path of least of resistance. Hence it really doesn’t matter which side the connector is attached to.